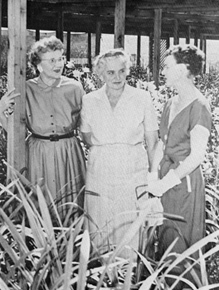 Mary Bea Ireland: Mary Bea (center) was the wife of Santa Barbara community benefactor Harry B. Ireland. She was also the widow of Fred J. Noonan, Amelia Earhart’s navigator, who perished when the aircraft crashed. Mrs. Ireland was an influential Santa Barbara orchid hobbyist with a huge collection of cymbidiums. 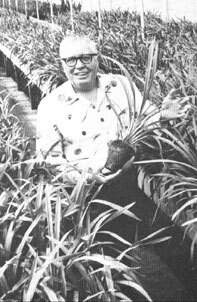 Samuel B. Mosher of Dos Pueblos Orchid Company, which was located just north of Santa Barbara, California. The orchid is truly a flower of superlatives. Even a complete layman in botany is captivated by the diverse beauty of orchids. Both species and hybridized versions run the spectrum of color and size, with some blooms as tiny as pearls and others that grow as big as dinner plates. Whether clinging to tree trunks high in the tropical rainforest, sprouting as seasonal blooms in misty South American mountains or wedged between craggy rocks at forest edges, orchids are among the largest and most diverse of the flowering plant families. So it's no wonder that plant collectors have been drawn to the fascinating flower forms since they were first discovered by jungle hunters and brought to the civilized world in the 1700s. Orchid hunting became a well-funded trade in the middle of the 19th century. Wealthy collectors paid for expeditions to the remote corners of the tropics to procure the most uncommon, as-yet-undiscovered orchids. 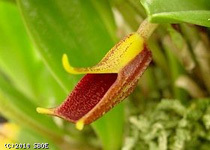 Plants were routinely plundered and many orchids became rare or extinct. Only a portion of the collected plants survived long treks through the wilds and onto ships to the world's largest port cities. Many of those early plants became the property of botanists in Great Britain, and even today newly discovered species and hybrids continue to be registered with England's Royal Horticultural Society. California's Central Coast became a Mecca for orchid hobbyists in the early part of the 20th century. Wealthy families who established estates to enjoy the Mediterranean-like climate of coastal California sought the services of renowned horticulturists and landscape architects to establish their lavish gardens. 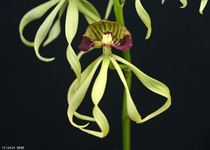 With connections to famed English orchid purveyors, the horticulturists advised their clients to amass huge collections of the finest imported cymbidiums, paphiopedilums, odontoglossums and other varieties. Soon coastal estates were brimming with orchids that thrived outdoors in elaborate raised planting beds under oak trees, or were stocked in climate-controlled greenhouses. Early pioneers included Aleck Stribling of Gallup & Stribling Orchids, Knute Hernland of the Dos Pueblos Orchid Company and Paul Gripp of the Santa Barbara Orchid Estate. In its heyday in the 1950s and 1960s, Hernland managed Dos Pueblos Orchid Company in Gaviota (just north of Santa Barbara), which was conceived and owned by Signal Oil magnate Samuel B. Mosher. It developed cult status in the orchid community and cut-flower business as one of the largest purveyors in the world, with 22 acres of greenhouses, a $1.5 million collection of the finest breeding stock and a lavish showroom that entertained thousands of visitors annually. The facility eventually closed in the late 1980s. But other Central Coast growers prevailed and found their own unique sales niches. With th advent of mass cloning, some growers catered to both orchid enthusiasts and the lucrative flower market with a huge range of cultivated native and hybrid species. Gallup & Stribling of Carpinteria (just south of Santa Barbara, Calif.) remains as one of California's largest orchid growers with 48 acres of farmland, a state-of-the-art breeding, growing and distribution facility, and visitor center. Likewise, Westerley Orchids is a corporate grower with acres of greenhouses and has a retail center open to the public. Other "boutique" nurseries, with their wealth of growing experience spanning decades, chose to specialize on a smaller scale. Both Santa Barbara Orchid Estate and Cal-Orchid (both just north of Santa Barbara, Calif.) offer outdoor temperate orchid varieties such as cymbidiums, laelia anceps and epidendrums, presented in a mix of rustic outdoor settings, shade houses and greenhouses. 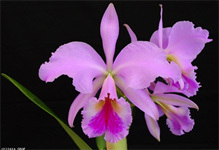 Zuma Canyon Orchids (Malibu, Calif) offers a wide selection of phalaenopsis and dendrobium. Orchids Royale (Carpinteria, Calif.) specializes mostly in cymbidiums grown in greenhouses. Visit our Growers Page for information about each of the nurseries on the California Orchid Trail and their visitor locations and hours of operation. 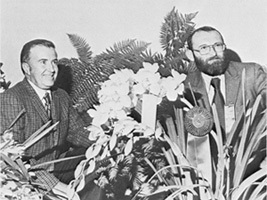 Aleck Stribling and Gary Gallup pose next to a prize-winning cymbidium at the Santa Barbara International Orchid Show. Aleck Stribling and Emmet Gallup formed Gallup & Stribling in 1959, one of the premier orchid growing companies in the world.